Runs, walks, Ovarian Cycle rides, Facebook Fundraisers, dinners and virtual campaigns—these are just some of the ways our dedicated supporters throughout the country are raising awareness and helping fund the science to beat ovarian cancer. They are men, women, and children of all ages, but they share one thing in common: they have been affected by ovarian cancer, and they want to do something about it. Now you too can join us in the fight to change the future of ovarian cancer! 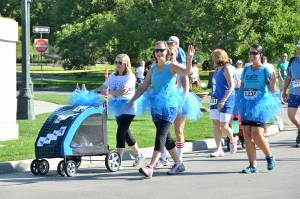 Learn about Ovarian Cycle and how you can plan a ride in your community. Have another idea for an event? Complete our brief DIY event proposal form and a member of our events team will follow up with you. Create your own fundraising page to honor a loved one or run a race for the cause–become an OCRA Hero. Get inspired! Check out this great video from the Find Your Sunshine Benefit Concert, a fundraiser organized by supporters in Houston, Texas.